In a new note he proposes a fairly dramatic communications option for the Fed – setting a target for the level of nominal consumption – which is definitely not the kind of thing you’re allowed to say in public when you work at the Federal Reserve Board. Seems to me that, as the idea of NGDPT, level targeting, has recently been all over the news and even mentioned in discussions within the FOMC, that Mr Sheets is just tossing an alternative, apparently similar idea “with several advantages” to get “noted”. First problem: “It keeps the focus on consumer prices”. No, it doesn´t. It´s concerned with Nominal consumption. Prices and quantities will be whatever they will be. Additionally, consumer prices are a “bad” index. Second problem: “A stable path for consumption…is what consumers want…”. OK, granted that consumers don´t like to be “all dressed up” one day and “naked” the next, but the particular stable LEVEL of consumption is the result of “optimizing decisions by the consumer”. So, to target a component of NGDP can get you into trouble. 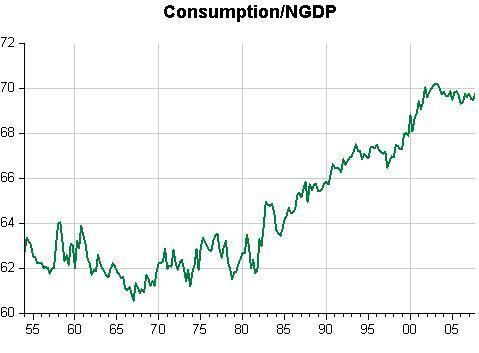 For example, the ratio of consumer expenditure to NGDP has not remained stable (stationary) over time. Note in the picture below that right about the time the “Great Moderation” began, the consumption-NGDP ratio begins to climb. Why? That´s the time that the economy became more stable and decision horizons were extended. In that case, if the Fed is targeting the level path of consumption, he´ll be interfering with private decisions and Reducing welfare (in addition to likely destabilize the economy). Third problem; Since the start of the “Great Moderation” the volatilities of consumption and NGDP are the same! So the implication of a less volatile monetary policy from targeting consumption is also not true from this perspective. Fourth problem: Government expenditures are determined through the political process. Imagine that society wants “more government”. If the Fed does not allow private consumption to fall, NGDP will begin to trend up, meaning higher inflation. Fifth problem: the argument that it “might be easier to rally political support” is laughable! So, all in all, a bad move. I agree with Marcus Nunes, but at least it looks at the problem of this recession from the right angle…Scott Sumner had a good take on this.